November 20, 2018, Tuesday, 7:30 P.M. An evening of poetry and music celebrating Bob Dylan, featuring local poets in the new anthology, Visiting Bob, including Margaret Hasse, Tim Nolan and others. Location: The University Club of St. Paul, 420 Summit Avenue, St. Paul, MN 55102. Between Us won the Midwest Independent Publishers Association (MIPA) prize for the best book of poetry published in the region in 2017. 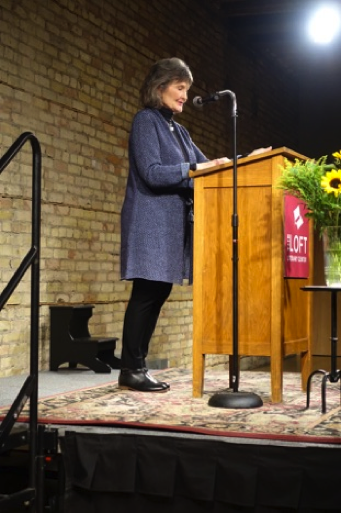 Margaret received an Artist Initiative Grant from the Minnesota State Arts Board to share her new book, Between Us, with seniors in book clubs, community centers, and through writing workshops. This activity is made possible by the voters of Minnesota through a grant from the Minnesota State Arts Board, thanks to a legislative appropriation by the Minnesota State Legislature; and by a grant from the National Endowment for the Arts. Margaret is featured in an interview in the November 9, 2016 issue of the Highland Villager. Read it here. The Maria Faust Sonnet Festival named Margaret’s sonnet, “A Writer’s Ritual on a Winter’s Night,” among the top poems in its 2016 contest. She received a prize of $100. 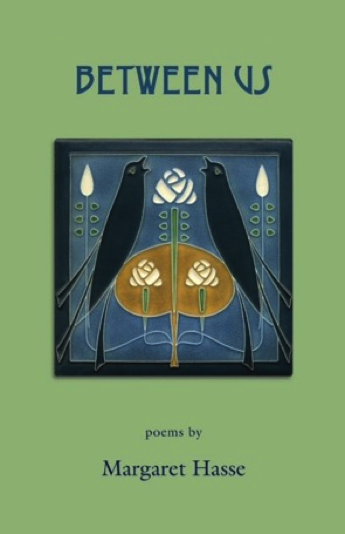 If you happen to love Door County, find Margaret’s poems in a new anthology called Soundings: Door County in Poetry. Take a look http://littleeaglereverse.blogspot.com, and climb aboard the oranage bus. A review of Earth's Appetite by editor Joel Van Valin appeared in Whistling Shade Literary Journal, Spring-Summer 2014. Read it here. Read the November 2013 article about Hasse and her new book in the Villager, click here. Margaret was among the guest writers at The Mississippi River Creative Writing Workshop in Saint Cloud on Tuesday, June 17. The workshop, led by William Meissner, ran June 16-19, 2014. - “You’ll Never Know” in St. Paul Almanac 2014. 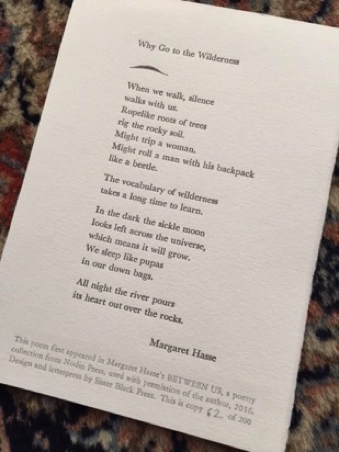 Margaret has a poem called “Prairie World and Wanderer” in a recent issue of South Dakota Review, a publication associated with the University of South Dakota in Vermillion. She’s especially happy about being in this journal because she grew up in Vermillion and her father was on the math faculty at the U.S.D. A poem about bicycles is in the 2013 St. Paul Almanac. 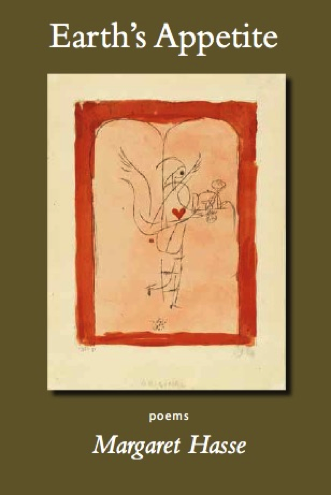 Poet Lore’s newest issue includes Margaret’s poem, And All Points West. MRP Arts Reporter, Marianne Combs, featured Margaret’s poem, “Disguises,”on her October 11, 2010 State of the Arts blog. 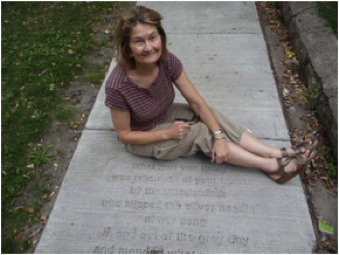 In April 2010, Minnesota State Arts Board awarded a $5,600 artist grant to Margaret for travel and exploring new directions for her next book of poetry. Milk and Tides won the Midwest Book Award in Poetry from the Midwest Independent Book Publishers Association. 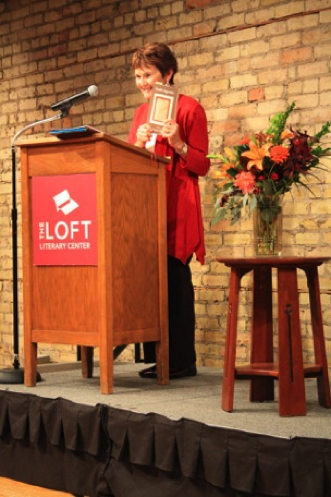 The award was presented on May 13, 2009, at the Minnesota Humanities Center. Beloved on the Earth: 150 Poems of Grief and Gratitude, a 2009 anthology from Holy Cow! Press, includes Margaret's poem, "A Breeze Bends the Grasses." November 13, 2018, Tuesday, 6:30 P.M. When we know something by heart, we’re saying we care about something enough to remember it and carry it around with us wherever we go. Join poet/performers Donte Collins, Margaret Hasse, and Naomi Cohn as they answer this question in poetry and conversation. Hear words presented from the heart and join in a conversation about poetry and the things we value enough to remember. Rondo Community Library, 461 Dale Street N., St Paul, MN 55104. November 7, 2018, Wednesday, 7:00 P.M. Birchbark Books Reading Series, with Elizabeth Weir, William Reichard, Stanley Kusunoki, and Margaret Hasse at The Bockley Gallery, 2123 W. 21st Street, Minneapolis. October 24, 2018, Wednesday, 7:00-8:00 P.M. Reading at Moon Palace Books, 3032 Minnehaha Avenue, Mpls, 55406. Louis Jenkins, Freya Manfred and Margaret Hasse read recently published work celebrating the vital lifeline of nature, the fragile mortality of life, the passionate arc of relationships. September 19, 2018, Wednesday, 10:00-11:30 A.M. Presentation at Poetry Club of Edina by poets Ted Bowman and Elizabeth Bourque Johnson, co-editors of The Ice Breaks, poems of loss and renewal, along with Margaret Hasse and Norita Dittberner-Jax, who are represented in the anthology. Hasse and Dittberner-Jax will also read from their recently published collections. All are welcome to attend. Edina Senior Center, 5280 Grandview Square, Suite 101, Edina, MN 55436, 952-833-9570. August 11, 2018, Saturday, Northwoods Art & Book Festival, Hackensack, Minnesota, 9:00 a.m. - 3:00 p.m. with literary events including a discussion and reading from their latest books by Margaret Hasse and Michael Dennis Browne. August 2, 2018, Thursday, Midstream Reading Series with cello prelude 6:45-7:15 p.m. and reading 7:30 - 8:30 p.m, featuring Michael Dennis Browne, Sharon Chmielarz, Margaret Hasse, and Danny Klecko, Blue Moon building, 3820 East Lake St., Minneapolis, corner of 39th and East Lake Street. Upstairs. Entrance just west of the Blue Moon coffee house; up the stairs and to the left. Not wheel-chair accessible. Plentiful street parking. 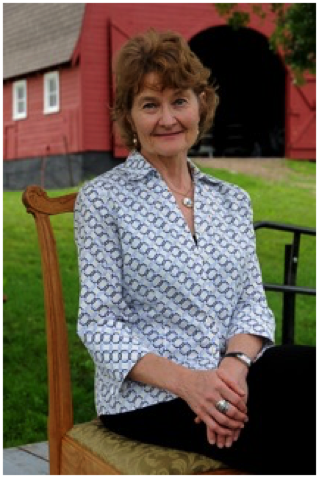 April 11, 2018, Wednesday, 4:00—6:00 p.m. Margaret Hasse will be the featured reader at the annual Pankake Poetry Reading, Elmer L. Andersen Library, Room 120, University of Minnesota. Free and open to the public. Reservations begin February 1, 2018. More information about the reading is here. December 6, 2017 Wednesday, 7 p.m. Western U-Plaza (previously Old Home building) corner of University and Western Avenues, 360 University Avenue, Saint Paul, MN 55103. Impressions project event sponsored by Saint Paul Almanac to release 6 new poem-posters for the metro transit system, including ones by Margaret Hasse and Tim Nolan. Each of six poets read her or his work. All the artists discussed their process. October 17, 2017, Tuesday, 7:30 p.m. Jim Heynen coordinated a reading as part of the Carol Connolly reading series in honor of poet John Calvin Rezmerski who died in 2016. Carol Connolly University Club reading series at the historic University Club, 420 Summit Avenue, Saint Paul. September 14, 2017, Tuesday, 7:00 p.m. Margaret Hasse read with poet Maryann Corbett at Subtext Books, 6 W 5th St, St Paul, MN 55102. June 21, 2017, Tuesday, 7:00 p.m. Poets and Writers and Musicians against the War on the Earth, with writers such as Peter Campion, Ed Bok Lee, Freya Manfred, and Margaret Hasse. The location was Saint Joan of Arc Church, 4537 3rd Avenue S., Minneapolis. April 20, 2017, Thursday, 7:00 p.m. Poetry Reading at Magers & Quinn Bookstore, featuring Emilie Buchwald reading from her new poetry collection, The Moment’s Only Moment, and Margaret Hasse, reading from her new Between Us, both books from Nodin Press. April 13, 2017, Thursday, 7:00 p.m. Saint Paul Almanac celebrated the release of its newest annual called “On a Collected Path” at Trotter’s Café and Bakery, 232 Cleveland Avenue N., Saint Paul, MN. 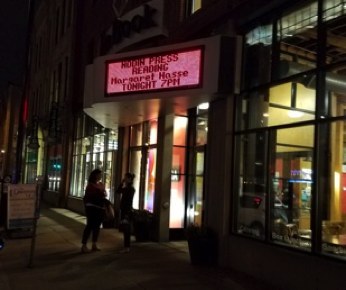 This reading featured Aegean Yang, Margaret Hasse, Mary Helen McHugh Franze, Sarah Koper, Linda Shaw, and Kristin Anderson. Hosted by David Stein. 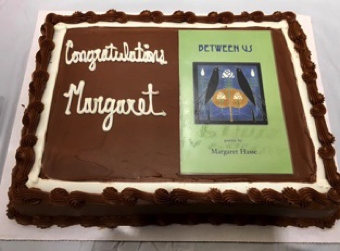 Between Us, Margaret’s new poetry collection, is available now! 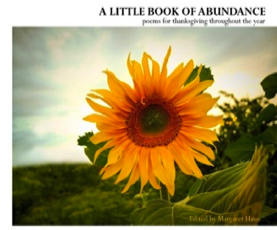 Red Bird Chapbooks has just released a limited edition anthology called A Little Book of Abundance: poems for thanksgiving throughout the year, edited by Margaret Hasse, with poetry from her writers’ workshop.